The potential etiologies of infection are diverse and these infections can often progress rapidly in SOT patients. 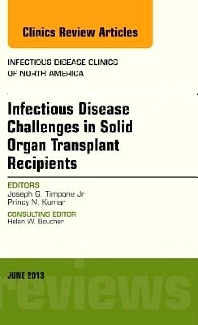 Diagnosis can be difficult, owing to the altered anatomy that sometimes follows transplant surgery. Many of the areas related to infections in SOT recipients are unresolved and controversial, and recognized emerging issues include donor-derived infection, the impact of pandemic influenza in the SOT recipient, and drug-resistant infections.